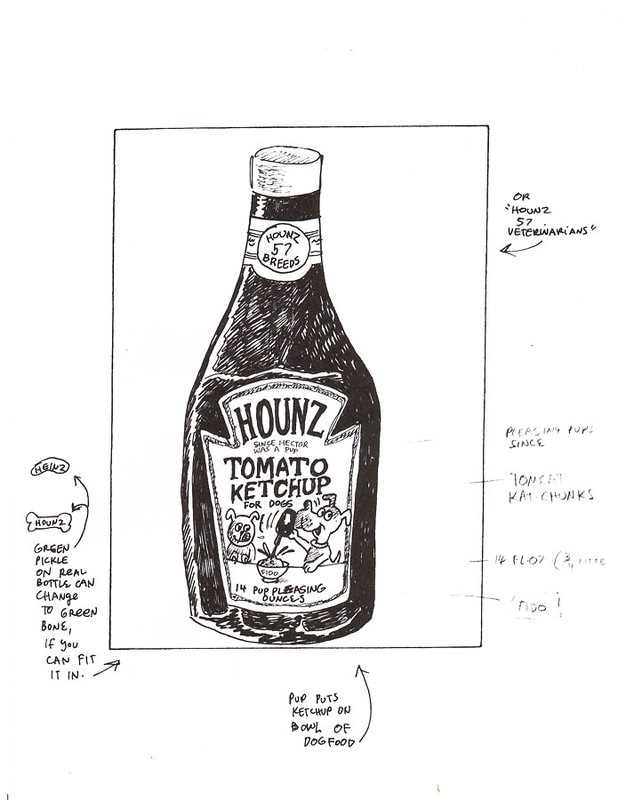 Lynch's rough sketch shows the product name as "Hounz Tomato Ketchup," though notes (perhaps from Topps?) on the right of the drawing suggest the subtitle "Tomcat Kat-Chunks." Also among those notes is the proposal to change Lynch's line "Since Hector was a pup" to "Pleasing pups since..."
The Topps Vault sold the finished art for "Hounz Cat-Chunks" for $2,649.00 in an eBay auction which ran from October 18-25, 2005. "Moronzon", a parody of the Verizon home page, is found on the back of "Hounz Cat-Chunks."